Google’s (s goog) acquisition of travel publisher Frommer‘s is being framed as another big push by the search giant to get into travel, following its purchase of ITA. But the deal also highlights how the worlds of travel and local are converging, with the two databases coming together as one big resource for consumers. In announcing the deal, Google said it’s possible that Frommer’s will be combined with Zagat, the local review service that Google bought a year ago for $151 million. I expect the two services will do just that because that’s where the world is going: Ultimately, one person’s travel planning is another person’s local discovery. Google understands that and it wants to be the first place people turn to whether they’re looking to go around the block or around the world. We should expect to see more Frommer travel information show up in searches on Google and Google Maps, as Zagat content does now, but I wouldn’t be surprised if there is a combined planning service that pulls the best of Zagat and Frommer’s at some point. To be sure, local and travel converge more in big cities; there is less overlap in places that are off the path of tourists. But even in rural or lightly populated areas, there’s still a need for local information and that information could still fill a need for the occasional visitor. Google is not alone in coming to this realization though it’s arguably the best positioned to straddle both the local and travel verticals. Social travel service GTrot reorganized around local discovery earlier this year because that’s how its users were using the site. 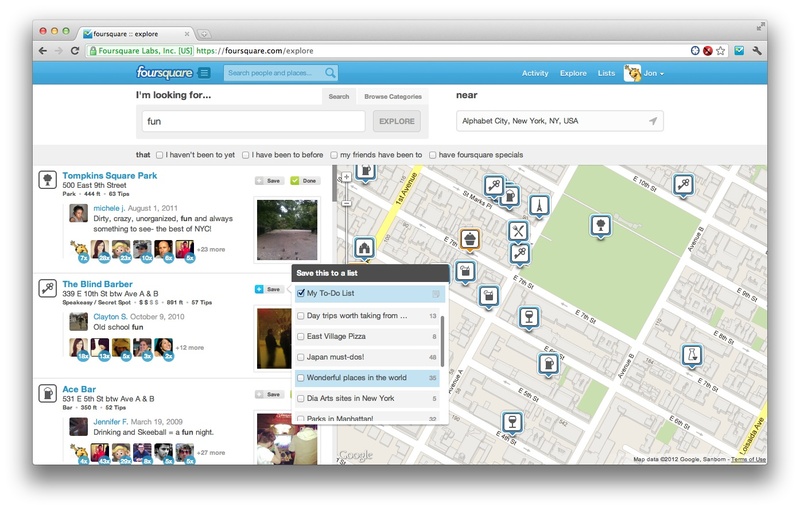 Foursquare, which maintains a trove of local data, has gone the other way with its Explore tools for the web. Explore allow users to research places they haven’t been to before by using check-in data and other information from friends. Gowalla, before it sold to Facebook, also made a turn toward being a local guide that would appeal to both tourists and locals. These examples suggest that we’re going to see more hybrid apps that combine travel and local information. The best travel services are increasingly focused on treating you like a local. And local services are becoming great resources for people looking to spend time in an unfamiliar city. I expect to see services like Foursquare, Yelp (s yelp) and others to build out their trip planning tools or combine their services with other travel services. And it’s likely that we’ll see more consolidation as companies from one vertical or the other tries to fill out the holes in their coverage. There is too much overlap between the two verticals not to. The purchase of Frommer’s may also point up the limitations of crowd-sourced information. To get comprehensive local data, Google may be acknowledging that it needs more professional curation to provide up to date information. But it’s also possible that Google may move Frommer’s to more of a TripAdvisor crowd-sourced model, which is in keeping with Google’s approach to user generated content. Hey Ryan, good insights. Thanks for sharing.